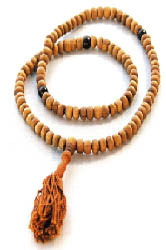 A timeless favorite, this hand-crafted and high-quality mala is made of fragrant sandalwood beads. Sandalwood's scent is thought to be conducive to pure mental states and meditation. It is of course, also pleasing to the gods, whose refined sense of smell reportedly affords them great pleasure from the fragrance of sandalwood. For that reason some consider sandalwood malas ideal for mantra repetition, but all of our malas are equally as popular. These are fair-traded and sales from these malas go directly to the Buddhist communities who make them. They cost a little more, but they are authentic items imported directly from Nepal.